Well, there you have it – a map put out by German newspaper Bild that purports to show the average breast cup size by country. So where will you find the largest breasts in the world? Russia, Finland, Sweden and Norway all weigh in at an average “greater than D cup” – though the United States, Venezuela and Columbia all factor close behind, with average D cups. Meanwhile, the most petite bustlines can be found in Africa and Eastern Asia. While this likely isn’t the most scientific map (we don’t know if they factored breast augmentations into the average size, though by the looks of it, my guess is they did), it does help give you an idea of which cultures may influence the desire to have a certain breast cup size. 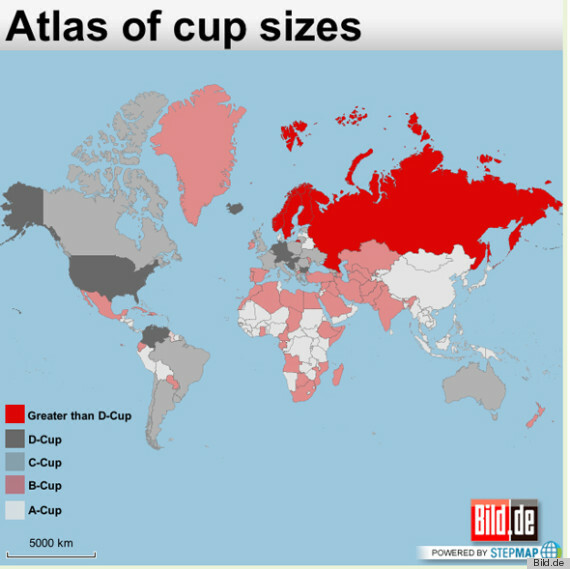 I wonder what sources Bild used to come up with those stats, since it’s very surprising that the largest average cup size come from some parts of Northern Europe. Yet even though Russians and Scandinavians are at the top of that record, the individual record for the largest natural one (Annie Hawkins-Turner) comes from the US. This is the first time I’ve seen this Atlas. Do the figures include artificially enhanced breasts? The US and Venezuela have the highest rates of cosmetic surgery per capita. If excluding cosmetic surgery, Britain would be my bet.